A dark cloud when observed with optical telescopes, the Chamaeleon I region reveals itself as an active hub of star formation in this far-infrared image from ESA’s Herschel space observatory. Only around 550 light-years away in the southern constellation of Chamaeleon, it is one of the closest areas where stars are bursting into life. Launched in 2009, Herschel observed the sky at far-infrared and submillimetre wavelengths until 2013. Sensitive to the heat from the small fraction of cold dust mixed in with the clouds of gas where stars form, it provided unprecedented views of the interstellar material that pervades our Milky Way galaxy. Herschel’s extraordinary scans uncovered a vast and intricate network of filamentary structures everywhere in the Galaxy, confirming that filaments are crucial elements in the process of star formation. After a filamentary web arises from turbulent motions of gas in the interstellar material, gravity takes over, but only in the densest filaments, which become unstable and fragment into compact objects – the seeds of future stars. Chamaeleon I is no exception, with several elongated structures weaving their way through the cloud. 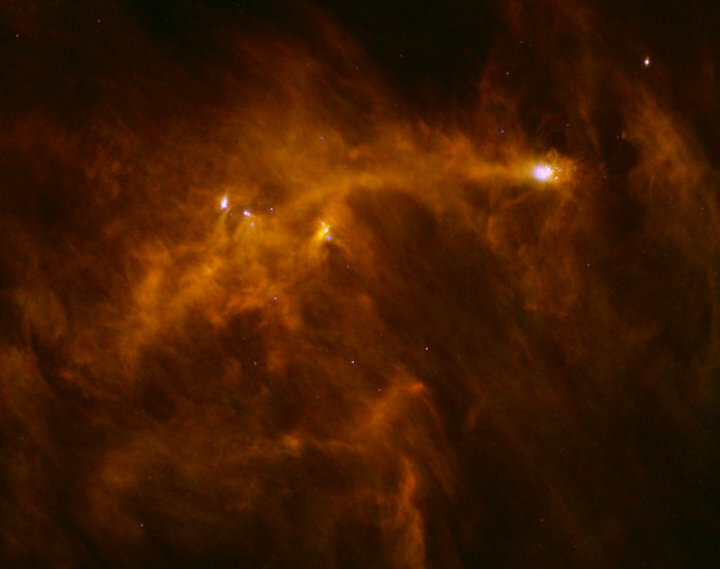 Most of the star-forming activity is taking place at the convergence of filaments – in the bright area towards the top right and in the vaster region just left of the image centre, sprinkled with newborn stars that are heating up the material in their surroundings. Analysing images like this, astronomers have identified more than 200 young stars in this two million year-old cloud. Most of these stars are still surrounded by a disc of leftover material from the formation process, which may evolve and later give rise to planets. Owing to its relative vicinity, Chamaeleon I is an ideal laboratory to explore protoplanetary discs and their properties using Herschel data. This image was first published in a paper by Á. Ribas et al. (2013), which presents a study of protoplanetary discs in this region. It was also shared as a #HerschelMoment during a public campaign on Twitter to celebrate the legacy of ESA's observatory in September 2017. This three-colour image combines Herschel observations at 70 microns (blue), 160 microns (green) and 250 microns (red), and spans about 2.5º on the long side; north is to the right and east is up.